The Atlanta metropolitan area is one of the fastest growing in the country. With such a rapid increase in development, the cityscape is changing to accommodate young professionals, families, and active empty-nesters who are looking for a vibrant city like Atlanta to call home. More than ever, buyers are choosing Atlanta condos due to their convenient location in the heart of the city, minimal upkeep, upscale amenities, and top-of-the-line security features. Intown Atlanta condos are considered a hot commodity by today's most savvy property buyers as they offer the convenience of an apartment and the benefits of property ownership. Plus many Atlanta condos offer plenty of amenities, like workout facilities, a community pool and hot tub, and a convenient system for recycling and waste removal. Areas such as Midtown and Buckhead are seeing an explosion in luxury loft and condo developments, with investors eagerly snatching up these real estate gems. Conversions can be found in Downtown Atlanta within former department stores, bank buildings, and mixed-use high-rises. Whatever your price range or needs are, the Atlanta condo market has just the right home for you. Always a sound investment, living in an Atlanta loft or condo ensures a convenient, low-maintenance lifestyle. Whether you choose to experience the hustle and bustle of downtown, or embrace the suburban life in the surrounding areas, you can find a perfect opportunity for condo living in Atlanta. From luxury high rises, to modern condominium complexes, to converted lofts in historic buildings, there's something to suit every style and taste. Quickly becoming one of the most sought-after locations in the city, there's a variety of downtown Atlanta condos available for purchase, ranging from high-rise luxury properties to contemporary studio lofts. Downtown residents enjoy unlimited cultural and entertainment amenities right at their doorstep. Don't want to deal with traffic? Living directly in the downtown area allows you to live, work, and play, minus the long commute. Experience all the city of Atlanta has to offer and choose a condominium at the heart of it all. Check out the Atlanta condos for sale below, or read more about choosing a condominium. 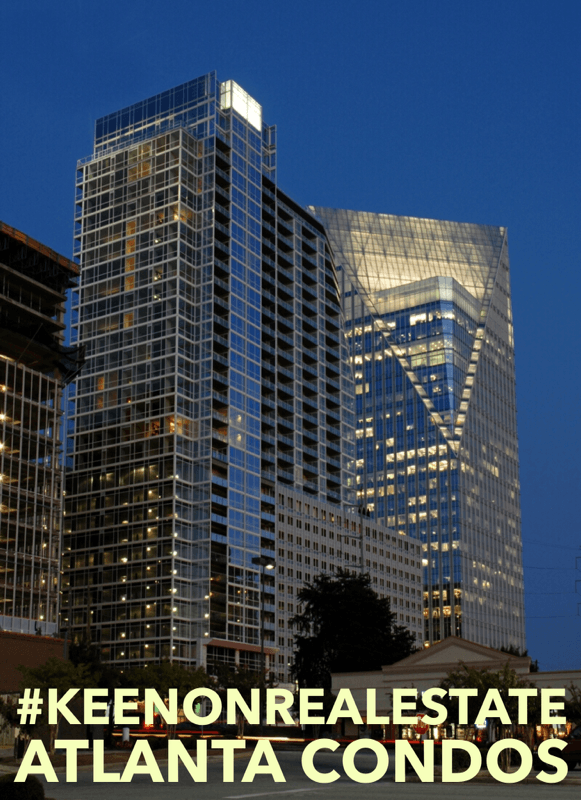 Register for more information on Atlanta condos. It's fast and easy! You can customize your search for Atlanta condos and save your favorite listings. Want to search for condos in specific neighborhoods? Below you'll find links to each area within the Intown Atlanta Loop that has condos for sale. Simply click on the links to learn more about condos for sale in your area of preference. If you have any questions about Intown Atlanta real estate, give us a call at (404) 270-9374 or contact us. Are you ready to discuss the benefits to choosing a low-maintenance condominium lifestyle? An expert from the Keen Team is waiting to talk to you - send us a message now!